Natividad Foundation’s partners provide funding and resources for Natividad’s nondenominational Spiritual Care program. 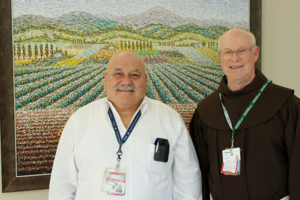 Spiritual Care Advisers Reverend Lawrence Robles and Father Paul Botenhagen are here to help patients and their families who are experiencing concern, anxiety, stress, sudden loss, or difficulties dealing with prolonged illness. Our Spiritual Care Advisers are standing by to comfort, to listen, to pray, and to talk. Being sick or injured can be frightening and emotionally draining. Our donors ensure we are able to offer important emotional and spiritual care for our patients and their loved ones. Spiritual Care Advisers are available to listen, to comfort, and to help patients and their families draw upon their religious or spiritual strength. Spiritual Care Advisers are available for emergencies at any time. Spiritual Care Advisers Reverence Lawrence Robles and Father Paul Botenhagen. Our Spiritual Care program is committed to caring for the special spiritual needs of children, adults and families. 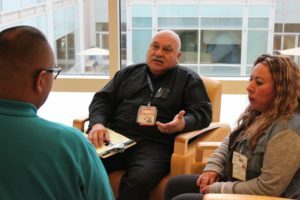 Spiritual Care Advisers are available to help patients and families of all faith traditions, explore spiritual questions and concerns that may arise during hospitalization. They are committed to providing resources from an individual’s own faith or spiritual tradition, helping people to explore the comfort, hope and strength these traditions provide. If you are a patient at Natividad and would like a visit from a Spiritual Care Adviser to address your spiritual concerns, please ask your nurse for assistance. An Interfaith Meditation Room is located on the 3rd floor. You can contact Spiritual Care Services directly at (831) 755-​4174. Your hospital Spiritual Care Adviser respects your religious traditions and personal experiences. Whatever your denomination may be, they come to support rather than to persuade. We also welcome the involvement of your home clergy while you are at Natividad. Reverend Lawrence Robles counsels a patient. A Meditation room/​Chapel on the 3rd floor of the inpatient building. Spiritual Care Advisers are assigned to each hospital unit and available to visit with patients and their families. Assistance available to patients, families and hospital staff in finding and deepening their spiritual resources. Copies of scriptures and holy writings from various faiths are available in the meditation room and from Spiritual Care Advisers. Literature to assist in developing faith and spiritual practices and to help those who are ill, recovering or grieving. Assistance with referrals to local faith communities and their leaders. Assistance with referrals to hospice care. For more information or to learn how you can support our Spiritual Care program, please call (831) 755-​4187 or email info@​natividadfoundation.​org or donate here.